I would definitely buy. Why what’s wrong in those products? I get good great value for money. I get warranty. Why shouldn’t I buy? During our search for a netbook for my friend, he decided to lookout for options like Macbook Air. But the price seemed too high for a netbook. Then it stuck upon me that Apple sells out refurbished products for good discounts on their US websites. I suggested him to check out that option while I myself did some investigation. I was astounded by what I discovered. What’s a refurbished product? It’s a product which has been returned to the manufacturer for some reason(mostly defect)and is being resold after certain changes are made/tests carried out. Now that we started with laptops, lets take and example of a laptop. Sometimes upon unboxing the laptop just doesn’t boot up. Or there are minor scratches on the surface. Or perhaps a dent on the body. We will never accept such product and will return it to the manufacturer. What happens then. It is certainly not thrown in to recycling. Majority of the times the product is perfectly good except for some small flaw/defect, the cause of which is determined at the manufacturers center. The flaw is rectified and the product is recertified after certain quality tests. In case of minor scratches some manufacturers do not rectify the scratches but sell them directly at low cost while specifying the cause of refurbished label. People, like me, are perfectly happy to buy such products at discounted rates since they get full warranty and value for money. Everyone’s happy and less e-waste. Even in cases of defects the manufacturers rectify and relist the product for less, certifying it refurbished. Products which have been used as display pieces in showrooms, or have damaged packaging when shipped are also sold as refurbished. They are perfectly good in performance with full warranty cover as specified by the manufacturer. You want it, you buy. Else move aside. There’s a huge line. So what about the cost effectiveness? When I bought my laptop in 2008 I did a lot of comparison with the prices in India and prices of refurbished laptops in US. The difference was about 200$ to 250$ back then for Dell. 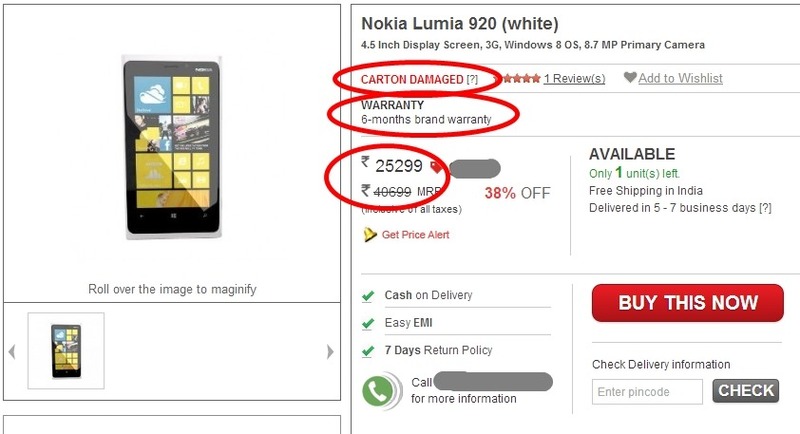 Sadly, Indians are not offered any refurbished product like in the US. I remember about 2-3 years back, beetel sold out refurbished Apple iPhone 3gs for quite a discount in India. But that was for corporate buyers in bulk. The refurbished iPhones were not available for retail customers. Coming back to Apple MacBook Air. There is a difference of about 150$ between refurbished and brand new MacBook Air. It is quite a good discount. Similar discounts are available on their MacBook Pros, iPods, iPads(499$ for a 32 GB third generation iPad wifi + Cellular) etc. They specify that the supply is limited but they keep on updating as and when they have more. Of course they don’t ship to India but you can always ask someone you know who’s coming to India. But what happens in India? We do have a large number of goods returned to manufacturers. What happens to them? Now this is my guess. The manufacturers might be repairing those products, testing them, but selling for full price without declaring them as refurbished. No way to find that out. Maybe the cell that I am using is refurbished. Same may be the case with my Laptop, my TV, my Fridge. You never know. Though refurbished products are not sold by manufacturers in India, there are a couple of websites offering refurbished products(they claim). You need to be cautious while buying from them as they could be duplicated. Always check what type of warranty they offer and the amount of discount over market price. If the discount is somewhere around 1%-5% its worth buying the product brand new from reputed website/store instead of refurbished. Remember. Always check the warranty conditions and compare price online.